This gallery contains several men's haircuts before and after and shows just how big an impact a new haircut can make on a guy's look. For even more pictures of men's haircuts, browse our hairstyle galleries and be sure to read our men's product guides, let us show you how to get a great men's haircut and how to choose the best hair length for you. 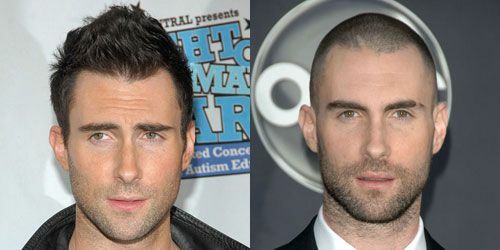 Adam Levine shows he can work just about any look well - from a spiky faux hawk style to a burr haircut. The longer style gives him a trendier look, while the burr shows a more rugged side. Click NEXT below for larger and alternate styles you can print and take to your barber or stylist. For this style, actor Nicholas Hoult (from the movie A Single Man) shows great versatility -- from a boyish shag haircut to a classic crewcut which really highlights his amazing features. Click NEXT below for larger and alternate styles you can print and take to your barber or stylist. Sometimes, the best haircut is to just get rid of it altogether. This model's coarse hair is difficult to style and shape. The burr haircut really shows off his outstanding features and changes the focus from his hair to his face. Click NEXT below for larger and alternate styles you can print and take to your barber or stylist. Either style works quite well for this model, but the shorter Caesar cut really opens up his face and gives him a more mature look. Facial hair gives a slightly rugged edge. Click NEXT below for larger and alternate styles you can print and take to your barber or stylist. This model almost looks like two different guys. The longer, separated style gives shows a youthful, trendy side while the short buzzcut gives a more masculine, mature edge. Click NEXT below for larger and alternate styles you can print and take to your barber or stylist. This model's hair has such great texture, it seems a shame to buzz it off. The two styles show just how much difference a haircut make -- both frame his face quite well. The short layer gives him a trendy, contemporary look, while the butch and facial scruff would be well suited to an active lifestyle requiring a low-maintenance style. Click NEXT below for larger and alternate styles you can print and take to your barber or stylist. For this model, the spiky layer cut is a fun, youthful option where the hair becomes the focus. His short, faux hawk draws the eye down to the face and shows off his handsome features. Click NEXT below for larger and alternate styles you can print and take to your barber or stylist. Either style works well for this model's oval face shape. The longer, layered cut gives him more styling options while the shorter buzz highlights his face and provides a low-maintenance option. Click NEXT below for larger and alternate styles you can print and take to your barber or stylist. Channing Tatum is a guy who can work most any style and look great -- from a messy classic taper to a burr. Click NEXT below for larger and alternate styles you can print and take to your barber or stylist. Singer Jessie McCartney now sports a more mature Ivy League haircut rather than the highlighted shag he wore when he was a bit younger. Click NEXT below for larger and alternate styles you can print and take to your barber or stylist. These days, Dancing with the Stars dancer Mark Ballas has been sporting a #2 buzzcut and I like the look. He always chooses haircuts that work well with his facial features and I think either style works well. Click NEXT below for larger and alternate styles you can print and take to your barber or stylist. Often seen sporting a bit of facial scruff, Mark's clean-shaven look combined with a tight haircut is an excellent look for a formal occasion. This year, Dancing with the Stars' Mark Ballas has been sporting a tight buzzcut. The style works well for him and draws the focus to his eyes, one of his best features. Mark Ballas, in this photo, is wearing a slightly longer style with a little facial scruff. The style works exceptionally well with his hair and shows really nice texture. Zac Efron has come a long way since his High School Musical days. He rose to fame with a long shag haircut and has grown into a man with a short Ivy League style. High School Musical star Zac Efron's ​signature shag haircut works well with his facial features. A razor is used to give this style a shattered, shaggy look. 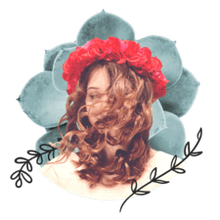 A small amount of styling cream controls fly-aways and adds separation. When Zac Efron became a household name by starring in the High School Musical series, he wore a loose shag cut. Fortunately, as he's matured, so has his haircut. This style is scissor cut short on the sides and back and left longer on top. The style can be worn loose as shown or styled neatly for a more formal look. For this hairstyle, Zac Efron's hair is clipped aggressively short on the sides and back and left finger length on top. A natural taper is created at the nape of the neck. Justin Bieber has certainly matured, at least from a hairstyle standpoint. The shag haircut gives him a very young, somewhat feminine appearance, while the pompadour is more, masculine, and opens up his face more. Click NEXT below for larger and alternate styles you can print and take to your barber or stylist. The Amazing Spider Man's Chris Zylka shows a great example of how a haircut can really change up a guy's looks. Chris has gone from a short, textured shag haircut to a one-​length all over buzzcut. The latter really brings out his facial structure. Click NEXT below for larger and alternate styles you can print and take to your barber or stylist.